The Earth attracts the Moon but the Moon, even if it is smaller, also attracts the Earth a bit. As the water that surrounds the Earth is light it moves all the time and it is attracted to the Moon like a magnet. When the full Moon or the new moon is close to Earth, the waves can rise very high on the beach. These are the tides of lively waters or great tides. It is said to be the rising tide. The water rises for 6 hours then descends for 6 hours and then it starts again following the rotation of the Moon around the Earth. You can see 2 high tides and 2 low tides in 24 hours. As the tides follow the movements of the Moon, each day the tide is shifted by 50 minutes. To find out if there is enough water to sail and carry the boats, seafarers use ephemerides, tables of figures prepared by astronomers that indicate the tidal coefficient, a number that varies between 20 (low tide) and 120 (tide of living waters). Tides are important not only for sailors but for the evolution of the Earth and the Moon. Because of the tides generated by the Moon and the irregularity of the Earth’s orbit, our planet is rotating a little slower, allowing the Moon to slowly move away from the Earth. 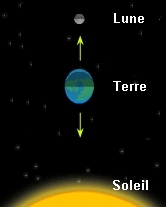 Thus every year the Moon moves 3.5 cm away from the Earth. It has been calculated that in 600 million years the Moon will be 21000 km farther away and there will be no more total solar eclipses and one day it is even possible that the Moon definitely leaves the orbit of the Earth. But rest assured that this will not happen for a few billion years, no doubt.